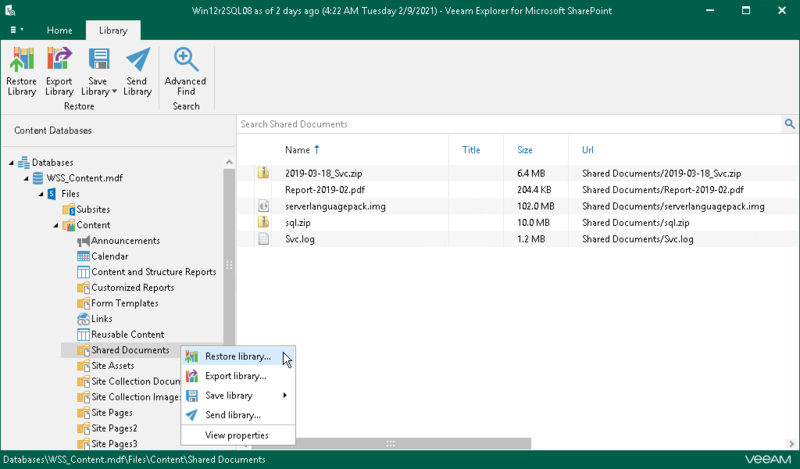 You can use Veeam Explorer for Microsoft SharePoint to restore Microsoft SharePoint items from any successfully created backup or replica of a virtualized Microsoft SharePoint Server. The backup or replica must be created with application-aware processing enabled and the corresponding options turned on. In the inventory pane, select the Backups or Replicas node. In the working area, select the necessary machine in the backup or VM replica and click Application Items > Microsoft SharePoint on the ribbon. You can also right-click the machine or VM replica and select Restore application items > Microsoft SharePoint content. Veeam Backup & Replication will open the Microsoft SharePoint Item Restore wizard. You can use this wizard to automatically extract the Microsoft SharePoint content database from the backup or replica and open it in Veeam Explorer for Microsoft SharePoint. Open Veeam Explorer for Microsoft SharePoint and press [F1]. Select Help > Online Help from the main menu of Veeam Explorer for Microsoft SharePoint. See Veeam Explorers User Guide.